Most of us remember exactly where we were when we first heard reports of certain historical events. My grandparents remembered where they were on the Sunday of December 7, 1941, while for my parents’ generation the crushing news came on November 22, 1963. Of course, all of us remember where we heard the first reports on the Tuesday morning of September 11, 2001. My list of memorable moments is long: I heard the news on August 16, 1977, from the AM radio in my family’s kitchen. On the same radio in the same kitchen, I listened to the live broadcast on February 22, 1980. I learned the news of September 28, 1978 on the playground of my elementary school, and I was in high school study hall when the reports broke on January 28, 1986. May 2, 2011. February 11, 1990. April 20, 1999. February 1, 2003. October 6, 1981. In each case, I remember the spot where I first heard—or watched—the news. One memorable date that holds special resonance for me is November 9, 1989. Last month, there were plenty of commemorations marking the 25th anniversary of that day’s historic event, the opening of the Berlin Wall. Here at Calvin, the German Department organized a program to mark the occasion, and to explain the Wall’s history to current students, all of whom had been born years after the reunification of Germany. As a historian of Eastern Europe, I was invited to say a few words at the event. My remarks were less historical than personal. Even though I had no direct connection to Berlin or the old East Germany, the opening of the Wall proved to be a decisive moment for me. I look back now and see how the events of 1989 put me on a path of study, research, and teaching, as well as making possible friendships and experiences that have enriched the last 25 years of my life. In the autumn of 1989, I was an undergraduate student at the University of Minnesota, a history major with plans to enter law school after graduation. I had long had an interest in the Soviet bloc, something like a desire to “know my enemy,” stirred by the heightened Cold War tensions of the late 1970s and early 80s. By my college years, Gorbachev’s perestroika had calmed relations between the U.S. and Soviet Union. In fact, there was a surge in enrollments in Russian language courses at universities across the country at that time. I was one of those students, learning Russian in the expectation of new opportunities in the reforming USSR. Given my interest in all things Soviet bloc, I had followed reports in the winter and spring of 1989 of negotiations in Poland between the government, the Catholic Church, and the Solidarity labor union. Another entry in my file of historic dates comes from those months: June 4, 1989. Of course, the shocking news of that day was the crushing of the Tiananmen Square protests in Beijing. But on that same day, Poland held the first open elections in Eastern Europe in more than 40 years, which Solidarity won overwhelmingly. Later that year, when school resumed in the fall, the news from the region was of East German citizens fleeing to the West by the thousands through Czechoslovakia and Hungary. In early November alone, before the Wall opened, over 62,000 citizens of the GDR traveled through Czechoslovakia to West Germany. It looked as if East Germany was going to empty out. Still, I was stunned on the evening of November 9 by the video of thousands of East Berliners pouring through the checkpoints and climbing on top of the Wall. Berliners were stunned as well. As we now know, the immediate opening of the Wall that night was not by deliberate government decision. The Politburo had decided to put new travel regulations in effect the next day, allowing people to exit directly to West Germany rather than having to travel through neighboring countries. However, the Politburo’s spokesman was unaware of the specifics when he appeared before the press. In reply to a reporter’s question of when the new regulations would be in effect, he answered: “As far as I know, effective immediately, without delay.” As word of the mistaken announcement spread across the capital, crowds streamed to the crossings, where they met confused border guards. The order came later that night to let the people through. From a historical perspective, it’s important for us to remember the unexpectedness of the Wall’s opening. When I’ve taught students about the events of 1989 in classes, we’ve looked at the deep debt of the communist governments, the overall economic stagnation, the dissatisfaction of the population, and, of course, the oppressive police state. From our standpoint, there is so much evidence of internal rot in the former communist states that we assume they were destined to fall. As a friend of mine in Prague once reminded me, that was certainly not the case. A week after the Berlin Wall had opened, my friend Daniel was detained by the Czechoslovak state police. They were interested not about Daniel, but another person at his church. After questioning, the police released him—and he went right away to warn his friend. But the man dismissed the imminent threat of his arrest. The regime’s days were numbered, he said. Daniel couldn’t believe what his friend was saying. As he talked with his friend on that day, November 16, Daniel still believed that he would live the rest of his life under communist rule. He remembered distinctly that conversation, and what he was thinking, and the date. 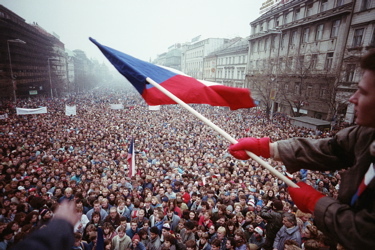 The very next day, November 17, 1989, the revolution began in Prague. Thousands of students in Prague protest the communist regime in November 1989. Perhaps it was because I was a student at the time, young and yearning for ideals, but this notion of morality in politics struck me as extraordinary. Havel’s words, his life’s story, and the whole drama of 1989 fired my curiosity in a way that’s still hard to explain. Eighteen months after that autumn of revolutions, I made my first trip to Europe, with a backpack over my shoulders. The least expensive flight was to Amsterdam. But I got on an eastbound train right away, first to Berlin, then to Prague. I returned from that trip to Europe and started law school in the fall. Torts and contracts, however, couldn’t keep my attention. A volume of Havel’s essays had just been published, and I read them during breaks between classes. Like other young Americans who traveled to Prague in the early 1990s, I also read through the novels of Milan Kundera, author of The Unbearable Lightness of Being. Havel’s essays and Kundera’s fiction stirred big ideas that carried me away from reading cases and writing briefs. By the sixth week of the semester, when I was reading The Book of Laughter and Forgetting in the back row of my torts class, it was clear the bar was not in my future. 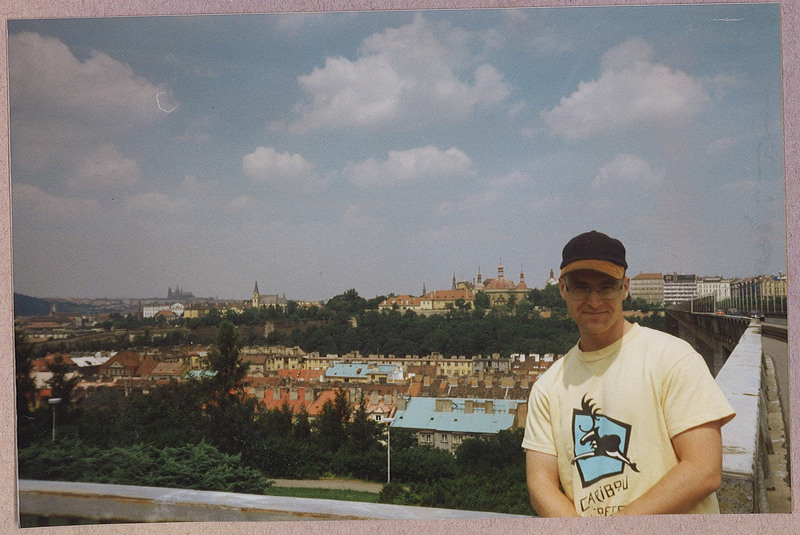 Bruce Berglund as a student in Prague, 1994. In the years since then, I’ve made plenty of trips back to Prague. My family and I spent two full years in the city (two of our children were born there during those stays). I’ve brought students to Cracow, Budapest, and Sarajevo; I’ve enjoyed memorable visits with colleagues in Warsaw, Berlin, and Ljubljana; I’ve visited mountaintop castles in Slovakia, Orthodox cathedrals in Romania, and a Roman amphitheater in Croatia. Unfortunately, my visits have been infrequent as of late. My work in the region has waned, while I’ve moved on to other projects and courses. Still, I have students who are drawn to Eastern Europe. This spring, one of our history graduates will take an internship at the U.S. Embassy in Bucharest. A recent graduate just began a doctoral program in East European studies. Other former students ended up in Bosnia, Romania, and Turkey. I’m always pleased that this often-overlooked part of the world still exerts a pull on young people. Looking back on how the events of 1989 pulled me, it is striking that our lives can be shaped—for decades to come—by moments in the news, or books, or classes that we experience when we’re 20 years old. The events of 1989 didn’t liberate me from an authoritarian regime, they didn’t give me freedom to write or work or worship as I chose. But they did change my life. This entry was posted in Bruce Berglund and tagged 1989, Berlin Wall, communism, Eastern Europe, history, moments that change your life, Vaclav Havel, Velvet Revolution. Bookmark the permalink.